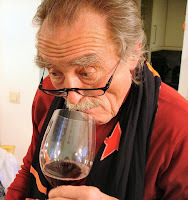 Strange World of Wine - What is that I'm Smelling??? Why is everyone's nose always stuck in their wine glass? What's the big deal about the smell of wine anyway? For me, aromas are one of the most fascinating aspects of wine. Wine is made basically just from grapes, yeast, and a few other additives, yet it can have aromas that have absolutely nothing to do with grapes. A sniff of red wine can reveal aromas of berries, leather, olives, bacon, roses, forest floor, barnyard (a friendly name for what you find on the floor of a barnyard, and I don't mean hay), pencil shavings, herbs, spices, tobacco, tar and so many more. White wine will tend to give you more delicate aromas such as peaches, honeysuckle, citrus fruit, tropical fruit, wool sweater, grass, and even cat pee (no friendlier word for that!). 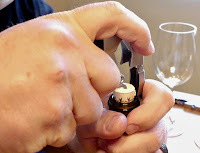 It is certainly not important that you are able to identify wine aromas in order to enjoy a wine, and in fact reading some professional wine critics may be intimidating as they describe in excruciating detail what aromas they detect in a wine. Don't be too impressed - it's their job to write big flowery reviews, and you can only write "black fruit" so many times before you need something more along the lines of "a hint of damson plum, picked at the peak of ripeness from a dew covered orchard in early summer." I find it a challenge to try and identify the aromas in a wine, but it takes work and a lot of practice (best homework ever! ), but if you prefer not to spend too much time with your nose buried in your wineglass, I will give you two things to think about. First, be thankful for those aromas! The human tongue can only taste five things: sweet, salty, bitter, sour, and umami (a savory flavor, think of soy sauce without the saltiness). It is those aromas that give wine its flavor, which is a combination of the five tastes plus the aroma. Food and drink don't taste as good when your nose is congested...this is why. 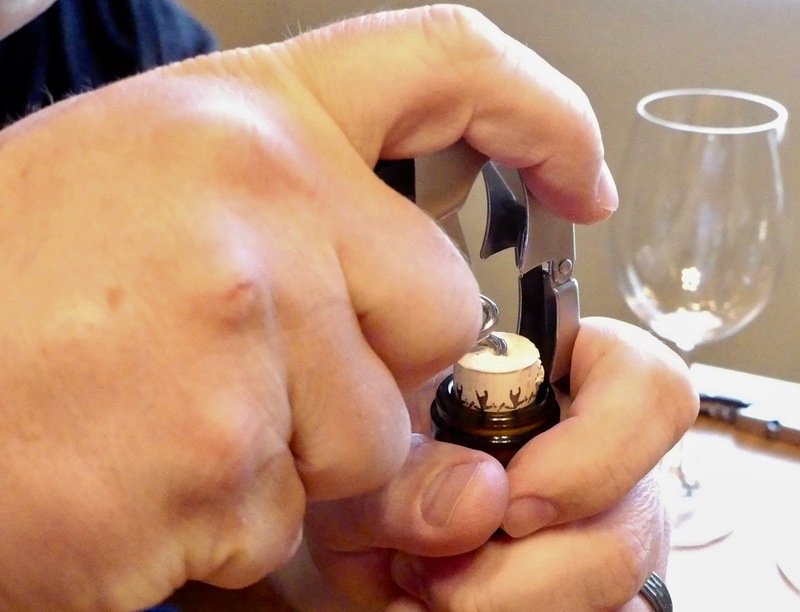 Second, it is important to give your wine at least a single sniff as it is a tool for you to use to determine if there is anything wrong with the wine. Smell nothing at all, or something like wet cardboard or a musty basement? The wine may be "corked" and while not dangerous to drink, will not be all that enjoyable. If you do accept the challenge to learn to identify wine aromas, my best advice is to keep an open mind about what you may be smelling. During some of my wine studies years ago I remember a Pinot Noir from Wild Hog that had a familiar smell that I just couldn't identify. After spending way too much time with my nose in the glass it finally came to me...dill! Not a smell you'd expect from a wine, but that is why it is important to keep an open mind. I had a similar experience more recently, which gave me the idea for this post. I was drinking a 2014 Caduceus Cellars Primer Paso from Arizona which is a blend of 93% Syrah and 7% of a grape I had not heard of before - Aleatico. There was an aroma there that I just could not figure out. Syrah is one of my all time favorite grapes, so I didn't think the aroma was coming from that part of the blend. Being less patient that I was when I was studying, I cheated and did some research on Aleatico. It turns out it is grape grown (almost) exclusively in southern Italy (the heel part of the boot). As I read on...mystery solved! One of the aromatic characteristics of this cult grape is...lychee fruit! 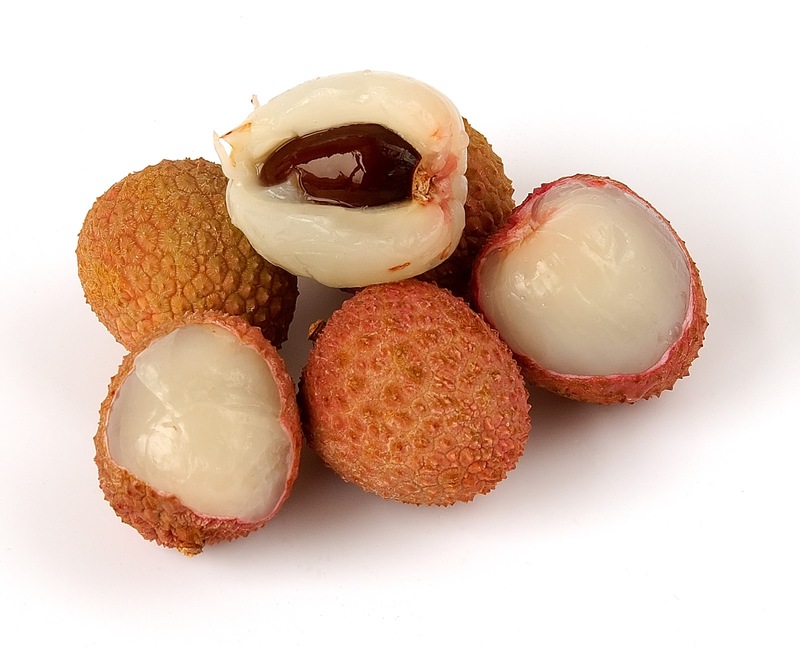 I love the smell and taste of lychee fruit, and thoroughly enjoy finding a white wine such as Gewurtztraminer that has lychee aromas. But a red wine that smells like lychee??? I would not have guessed in a million years because my brain would not put the smell together with what I was drinking - a big ole' yummy red wine. So - sniff those wines, a little or a lot is your choice, but do sniff! Strange World of Wine - What is Fining? Wine is just grape juice fermented with some yeast right? Yes! At least something I consume is vegan (pauses blogging long enough to take one more bite of luscious cheeseburger). Hold on - not so fast. In fact many if not most wines are not at all vegan. Most of the winemaking process is animal free - but a crucial step to give you a beautiful glass of crystal clear wine is called fining. This is where the animal products are used, and the reason I'll need to add some kale to my diet if I want to truly get my vegan on. Fining is the process where a substance (the fining agent) is added to the wine in order to trap and remove suspended particles left in the wine from the winemaking process. Fining not only leads to clearer looking wine, but can have beneficial impacts to the color, taste, and aroma of the wine. It can also be used to lower the tannin level and even remove some unpleasant aromas (such as rotten egg or onion) that may have developed in the wine (ewwwww!!!). My first up close look at the process of fining came during a tour of the Muga winery in Haro, Spain. Muga is a global brand, but still uses one of the oldest fining agents in the wine world - egg whites. Muga is a major wine producer, selling wines all across the world. They use a combination of traditional methods and high technology, and their process of finding definitely falls into the traditional category. 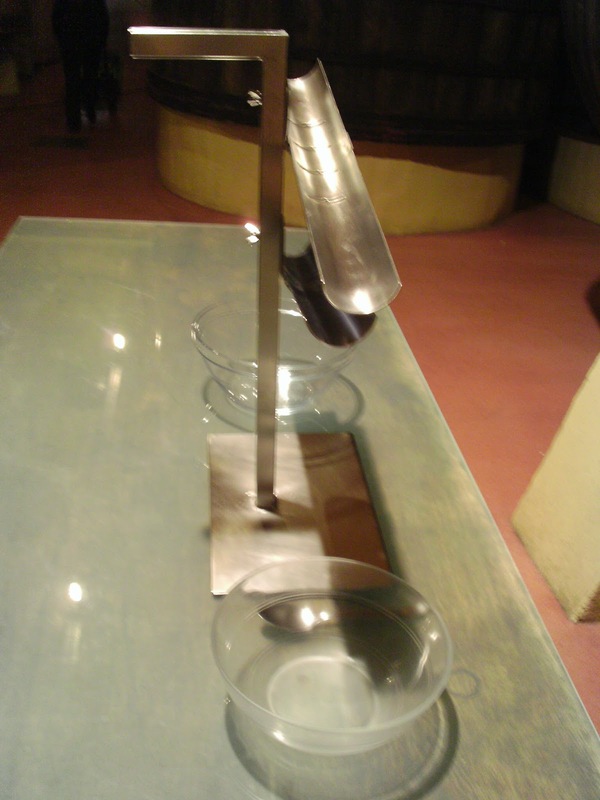 In the winery, they have this gadget -basically two half steel tubes angled in opposite directions. The top tube has a number of holes along its bottom. To capture egg whites for fining, eggs are cracked into the highest part of the top tube. As the egg slides down the tube, the whites fall into the holes and drips down to the tube below, which then ultimate slides down into the bowl on the left. The yolk then continues down and falls into the bowl on the right. Low tech, but very effective! With their philosophy of wasting nothing, the egg yolks are used to make candy which they sell in their gift shop. Rich, but super delish! So even though Muga produces a lot of wine, this contraption is sufficient for them to gather egg whites for fining since each egg can clarify a little over 6 gallons (23 liters) of wine. Check out the bottom of this post for a video showing more about the fining process at Muga. Historically, other animal based products have been used for fining, including bone marrow, mild protein, gelatin (including some made from the swim bladders of fish), and fiber from crustacean shells. True, these sound like strange ingredients for wine, but keep in mind they are not really ingredients, but tools to help make a clearer and better tasting wine. You will run across some wines that are truly vegan, as there are carbon and clay based fining agents as well. Why not experiment a little and try a "regular" wine and a similar vegan wine and see if you can tell any difference from the different fining agents used? Strange World of Wine - Movia Lunar 8, Orange Wine or Greenish Gray Wine? In my strange world of wine series, I'm going to explore some of the more unusual aspects of wine, wine making, and whatever other wine related gems I come across. This first post is about a wine I had at a recent wine pairing dinner that gave me the idea for this series. The wine was a 2008 Movia Lunar. This wine is from Slovenia and made with 100% Rebula, a white wine grape which is also found in the Friuli-Venezia Giulia region of northeast Italy, only there it is called Ribolla. This was my first wine from Slovenia, and first from this grape - which was very cool but definitely didn't fall into the "strange" category. Then the wine was poured. My mind was already reviewing some common descriptors of white wine color... would it be a lighter straw color, a bolder lemon color, or even a darker golden color? Would the wine be crystal clear, or would it be cloudy from a bit of sediment? Well, all the choices of descriptors I was contemplating were wrong, wrong, and really really wrong! Out of the bottle poured a clouded, greenish gray substance unlike anything I've ever seen poured into a wine glass. Both my wife and I had looks of shock and amazement on our faces, but our server's expression didn't change, so we understood this was what the wine was supposed to look like! So we bravely swirled, sniffed and took a sip. Very much characteristics of a white wine, some stone fruit, honey and spice aromas. I admit to being a bit afraid of what this sludge would taste like, but it turned out to be very crisp, and had a hint of yeast from the sediment, but not that different than wines that have been aged on their "lees" or dead yeast cells from fermentation. What an amazing and STRANGE surprise... and thus this series of posts was born. After doing some research I discovered that the wine is made as an "orange" wine, which means although it is a white wine, it is made more like a red by having the wine ferment with the skins of the grapes (typically for white wine, the grapes are pressed immediately and only the juice is fermented). For those not comfortable with the greenish grey cloudy glass of wine, before opening the wine bottle just needs to be rested for a few days to a week in an upright position so the sediment settles to the bottom. Then, carefully open the bottle without disturbing the sediment, and pour into a decanter until you start to see sediment in the neck of the bottle - then stop. Some accounts I've read say you may have to leave a quarter or more of the bottle behind in order to pour a clear wine. I highly recommend you seek out this wine to try something truly unique...orange wine is kind of unique, Slovenian wine is kind of unique for some... the tasting experience... truly unique. Also, try the wine both ways, decant off some clear wine but make sure to at least try the wine with all of its components. Once you get past the look of it... you won't be sorry! Stay tuned for more from the Strange World of Wine! Have any ideas or suggestions for topics? Please share them in the comments below. I have been a big fan of ONX wines in Paso Robles since I first tried them. Their wine blends don't worry too much about sticking to the classic blends, they just take their grapes and put them into intriguing and delicious combinations. This Level 22 wine was one I have not tried, and it does actually utilize grapes that you would find in a Southern Rhone blend. Still taking an intriguing approach, Level 22 highlights Petite Sirah as the main grape where in Southern Rhone wines, Grenache typically takes the starring role. Taste: Big and fruity, smooth tannins, nicely balanced and a nice amount of acidity. The Grade: I give this one an A. For my palate, ONX continues to deliver fantastic blends. Without the constraints of tradition, all their wines show such great blending skill. Over $50 is a lot to invest in a bottle of wine, but when you get delicious quality, the investment is worth it! Cheers! Typically, my more expensive "splurge" wine purchases are red wine and more red wine. A lot of my cooking also skews toward red wine pairing (red meat! ), and my wife and I consume considerably more red wine than white or rosé. When it comes to purchasing white wine, I am very value conscious. I want a good quality wine, but am not looking to spend more than $25 a bottle and in most cases closer to $15. At a recent tasting at our wine storage facility (living in Arizona, and having had our air conditioner go out in July will make one look for wine storage facilities! ), we tried this special cuvée Trimbach Riesling and it tasted very nicely. So nice in fact that even though it carried a splurge wine level price tag I picked up a bottle to pair with the right dish that needed that extra special white wine. The dish turned out to be a meal kit from Chefd.com for Miso Glazed Scallops with a Soba Noodle Salad. The sweetness of scallops, the umami of the miso, the herbal/vegetal taste of the edamame in the salad needed a complex wine, so I turned to this 8 year old Alsatian to see if it had the right stuff. Aroma: Peach, apple, honey and a nice amount of the aged Riesling petrol aroma that intensified as the wine warmed in the glass. This may sound strange if you've never experienced it, but it is my very favorite part of older Rieslings. Taste: Super dry like you should expect with an Alsace wine, but a fruitiness that gives you the sensation of sweetness. A nice bit of minerality as part of a very pleasant, long finish. How about the pairing you ask? A home run in my semi-humble opinion. The scallops were great quality and I managed to get a nice dark sear on them. The miso glaze made them savory and slightly sweet at the same time, and the crispness and fruitiness of the wine went along nicely. Good food and good wine, but the two together was even better - my definition of a perfect pairing! The Grade: I give this one an A+. Sometimes you come across a wine that makes you reevaluate how you think about white wine versus reds. This wine is one of those that may even lead me to cook more dishes that need a complex, quality white as a partner. Well... maybe a few more anyway! Cheers! 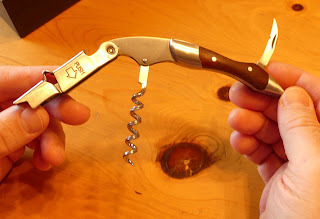 **DISCLAIMER** The corkscrew reviewed in this post was provided to me free of charge by Avina Wine Accessories. 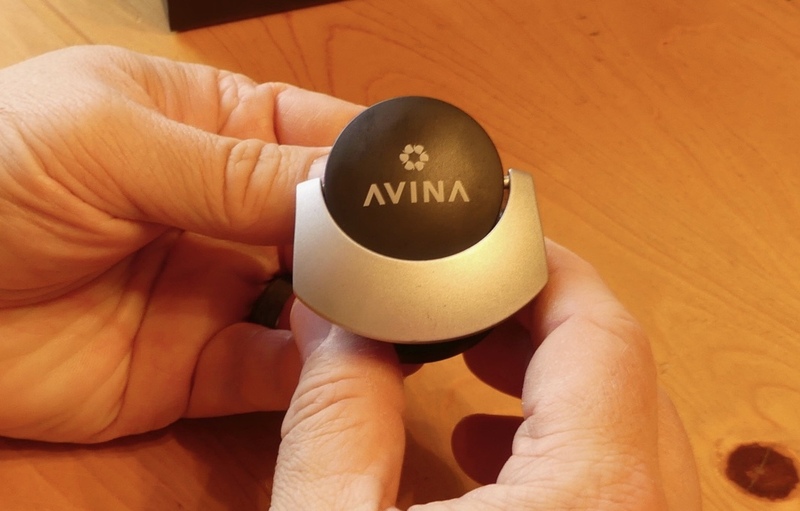 The fine folks at Avina Wine Accessories gave me the opportunity to select one of their products to review for wino4life.com. I browsed their online store, and one item from their line of corkscrews immediately stood out to me. I do appreciate a classic looking corkscrew, but even more I appreciate something with a different look - so I opted for the Rhino Corkscrew and Bottle Opener. It has an almost Craftman tool aesthetic to it that I really like. I feel more manly already! From my Wine Lover's Toolkit post, you'll see that a good corkscrew is the first item on my list. 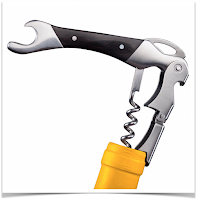 There are lots of wine related gizmos and gadgets out there, some crucially important while others are just cool to include in your toolkit (no shame in stocking up on the cool ones... I have plenty!) A really good corkscrew is definitely one of those crucial items. You must be able to efficiently and effectively release the wonder-filled contents of those cork sealed bottles of wine. 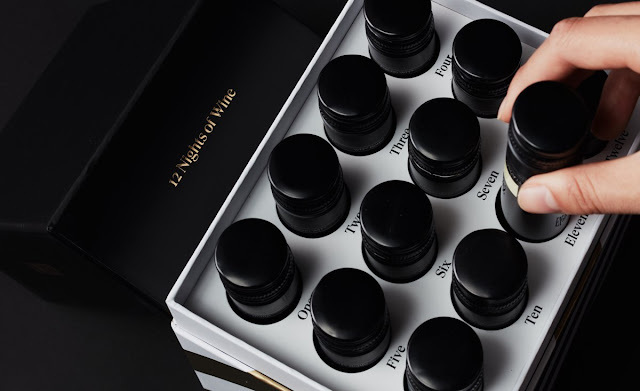 You could very happily subsist on only screw top bottles or boxed wines - but chances are you will eventually come across a cork that stands between you and your swirl and sip of delicious wine. Be prepared people!!! 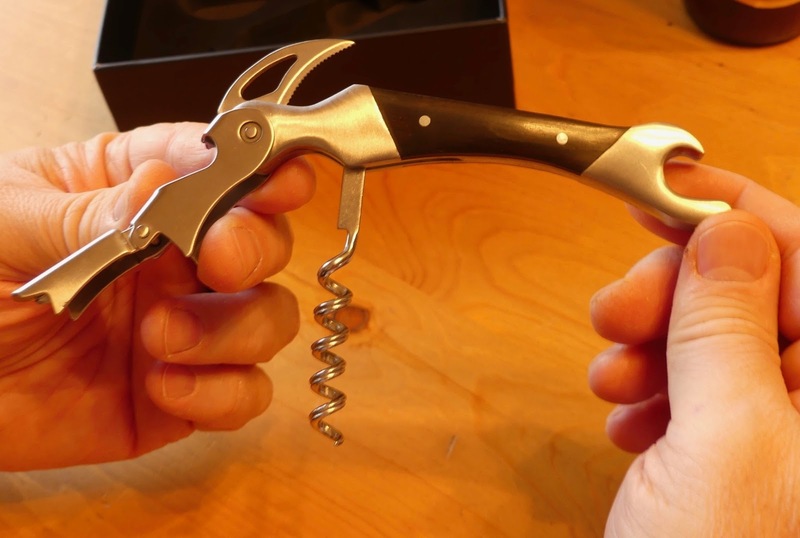 Before we get to the Rhino, let me first address what you should be looking for in your go-to corkscrew. Although there are other types available, for now I'll stick to just the "waiter's helper" or "wine key" version. 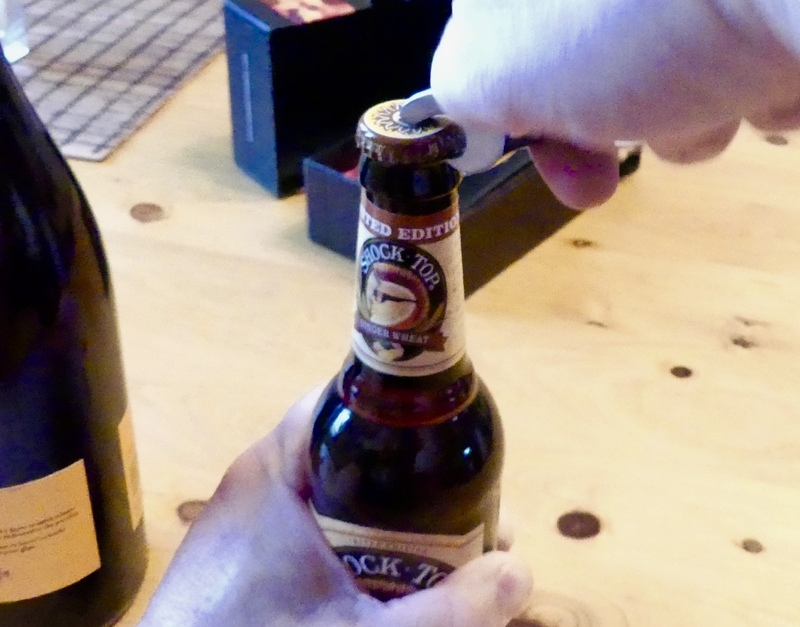 Along with the corkscrew, there is a special bonus of a bottle cap for your leftover wine. This item will not get much use in our household, as leftover wine is a rarity. To store extra wine for any length of time, it is best to remove the excess air in the bottle by pumping it out or replacing it with argon gas, but for an easy to use quick way to keep some extra wine for a short time, the cap is a nice bonus. This cap has a locking lever and appears to provide an excellent seal on a bottle. Now for the corkscrew itself. It feels hefty in the hand - very sturdy. It is a bit heavier than my Le Creuset. Everything on the corkscrew looks and feels like quality. Opening it up to take a closer look, I very much like the design just like when I first saw it on the Avina website. It has a hinged fulcrum, sharp tip on the worm, and a substantial serrated blade for cutting the foil. OK, now we know the Rhino has all the features we're looking, it's time for the main event. Let's put it to the most important test and open up a bottle of wine. The first thing I notice is the serrated blade. It has a more distinct curve to it than I've ever seen on a corkscrew, and it is a hefty little blade. Definitely the best foil cutter I've ever used. 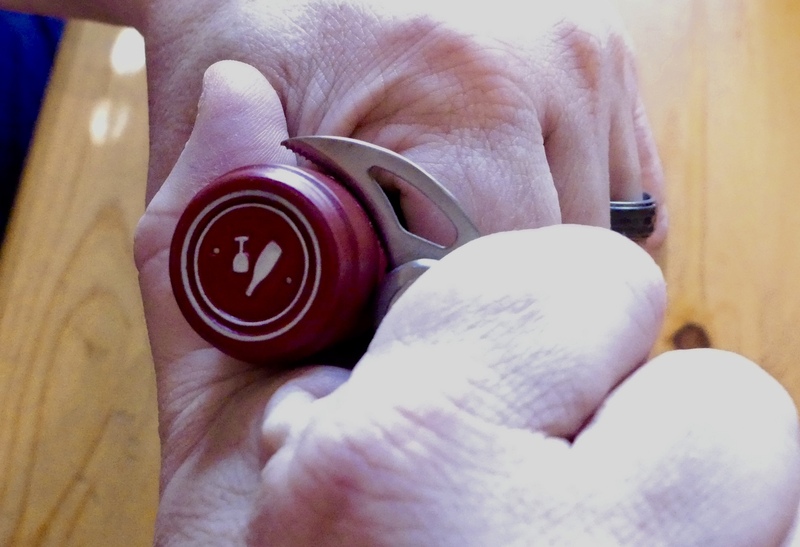 The worm has a groove that runs all the way down to the tip, which could be to provide a better grip on the cork - nice touch. The corkscrew was easy to use, and the best part is at the end we had an open bottle of Martian Vineyards Grenache to enjoy on a Sunday evening. Just to give the Rhino it's full workout, let's also crack open a beer. As with most corkscrews, the fulcrum has a bottle opener groove, but I opted for the Rhino horn end and voila! Overall the Rhino is a very impressive product. If you are in the market for a good corkscrew I would definitely suggest the Rhino and also suggest checking out the Avina website to see what else they have to offer. I'm going to keep on using the Rhino, and I'll get back to you with an update after we've popped a few more corks (and the occasional beer). If you are interested in purchasing a Rhino, or another Avina product, you can use the discount code AVINA15A which will give you 15% off any order. All you have to do is purchase from their website (www.avinawinetools.com) or Amazon.com and use the promotional code during the checkout process. This week I read with great sadness about the late frosts in Europe that may have ravaged the 2017 crops in France and Spain. In an ode to the hardworking growers throughout Europe facing this challenge, I wanted to open a bottle of Rioja. Many, many thanks to all those growers who face the challenges of nature on a regular basis, even when there is a risk of losing an entire year's grapes. Aroma: Restrained, some black fruit and a hint of oak. Taste: Also fairly restrained, well balanced with a good amount of acidity. The Grade: I give this one a B-. More of an old world version of Rioja with less fruit, and while it was a good wine, I would expect more at the $30 price point. The acidity level would make a great companion to food, especially some aged Manchego cheese. Join me in wishing the best for the growers in Europe after the tragic late frost. Breaking up is hard to do. My wine refrigerators at home are full. I've rented space in a temperature controlled wine storage facility. Still, I have joined far too many wine clubs. Initially I cancelled a few that were not too painful, but eventually there were some painful choices. One of those was Linne Calodo from Paso Robles. Really nice wines, interesting blends, but wines that need some time to age. Sadly, I cancelled my membership, but I would highly recommend visiting, trying, and buying their wines. As a consolation, I decided to taste their Zinfandel based blend - Outsider. Aroma: Wow! Dark and red fruit, pepper, cola, and Mmmmm...licorice! Taste: Big fruit, great balance. Lots of smooth tannins. The Grade: I give this one a solid A. Enough tannins to age for 10 years or more, but give it a decant for a few hours and it will be great. So good! Ugh! I miss you already. Can we still be friends??? Luckily I have a few bottles of Linne Calodo in my stash to enjoy and reminisce. Cheers!